MY CHILDRENS LAUGHTER IS MY FAVORITE SOUND! THE SOUND OF TH - ProudMummy.com the Web's Community for Mums. 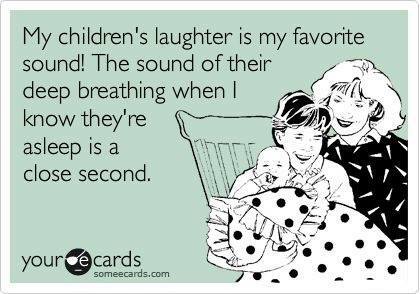 MY CHILDREN'S LAUGHTER IS MY FAVORITE SOUND! THE SOUND OF THEIR DEEP BREATHING WHEN I KNOW THEY'RE ASLEEP IS A CLOSE SECOND. Bert James or in Max's case - snoring!